An Aberdeenshire stone circle initially thought to be thousands of years old has been identified as a modern replica. An investigation into the site at the parish of Leochel-Cushnie found the stones to be about 20 years old. It was originally thought to be the site of a recumbent stone circle - until the man who built it came forward. The findings sparked excitement among experts and were widely reported. 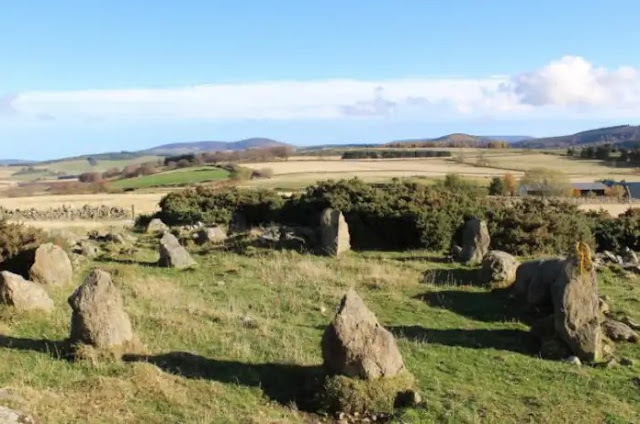 They were initially celebrated as an authentic recumbent stone circle by Adam Welfare of Historic Environment Scotland and Aberdeenshire Council's Archaeology Service. Further archaeological analysis of the stones was being conducted when a former owner of the farm contacted Mr Welfare to say he had built the stone circle in the 1990s. Neil Ackerman, historic environment record assistant at Aberdeenshire Council, said the development was "disappointing", but hoped the site would still be appreciated. He said: "I hope the stones continue to be used and enjoyed - while not ancient it is still in a fantastic location and makes for a great feature in the landscape. "These types of monument are notoriously difficult to date." Recumbent stone circles were constructed about 3,500 to 4,500 years ago and are unique to the north east of Scotland. Their defining feature is a large horizontal stone flanked by two upright stones, usually situated between the south-east to south-west of the circle.